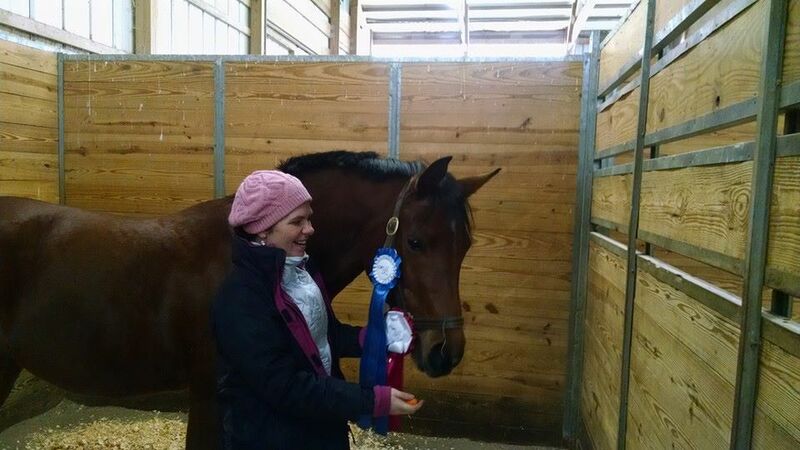 I went to the Turkey Trot (a local schooling show) with one objective in mind, schooling in the show ring. Prior to our last show, I went down centerline practically paralyzed with nerves. My only real goal was to get through the movements; halt at X, don’t go off course, canter when I’m supposed to and pick up the correct lead, and ride reasonably accurate circles. Savy quickly learned she didn’t have to work hard in the show ring, and I became a passenger. So for this schooling show, I put no pressure on myself to score well and had no expectations of being high in the ribbons. There were no more than 6 riders in each class so I mentally prepared myself for a pink or green ribbon, and fireworks in the arena. I am extremely competitive, so this was difficult for me. Generally anytime I change the status quo with Savy I get lots of bucks and pinned ears. Surprisingly she didn’t buck at the show, but there was a lot of ear pinning at the canter. The canter. My nemesis. I have never been awesome at riding the canter. It wasn’t so bad in hunters because we just kind of perched there anyway, but I still had trouble with my leads. Now that I understand bending, I get my lead each time just fine, but I have a tremendously hard time sitting the canter and following the movement. It doesn’t help that Savy’s canter used to be really difficult to sit at all. Used to being the key phrasing. Her canter has come a long way and there’s no reason I shouldn’t be able to ride it. My problem is I tense. I tense because Savy likes to be behind my leg, especially in the canter, and to get her forward I squeeze. Unfortunately I squeeze with every muscle in my body. This, of course, has the exact opposite affect and makes Savy very unhappy. I am learning to relax my body and move my hips with the movement. If Savy isn’t forward, she gets a boot with the leg. She keeps getting boots until she’s forward. We’ve make tremendous improvement in only one week. I still had some issues with the canter in the test, but I consciously attempted to relax. And while she wasn’t as forward as I would have liked, I didn’t stop pushing for it. Luckily I have videos of my ride and I am starting to see glimpses of the horse and rider I want us to become. Surprisingly we received a First and Second place in Training 2 & 3 respectively. This entry was posted in Dressage Shows, Training Updates and tagged Arabian Mare, Arabians in Dressage, Canter, Dressage, Dressage Show, Dressage Training Level, Harrington Dressage, Majestic Farm, Sassy Arabian, Schooling show, Training Level Test 2, Training level text 3, Turkey Trot, Working on Canter. Bookmark the permalink. ← Checking In – A New Job!